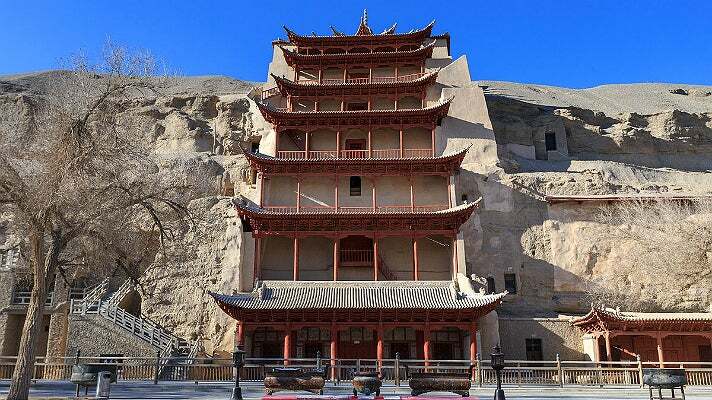 The Mogao caves, located near the town of Dunhuang in the Gobi Desert of northwest China, comprise 500 decorated Buddhist cave temples dating from the 4th to the 14th century. Filled with exquisite wall paintings and sculptures, the caves bear witness to the intense religious, artistic, and cultural exchanges along the Silk Road, the trade routes linking East and West. Exploring the history of the cave temple site from its founding in the 4th century, to its abandonment in the 14th century and its revitalization in the 20th century, the exhibition offers three complementary experiences. 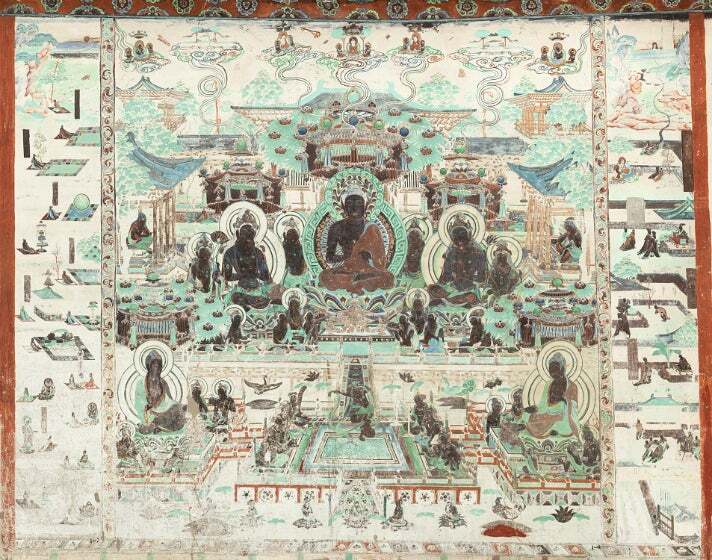 A temporary building on the Getty Center’s plaza will house three full-scale, hand-painted replica caves, filled with exquisite Buddhist painting and sculpture. The Getty Research Institute galleries will exhibit more than 40 objects discovered at Mogao in 1900 in Cave 17, known as the “Library Cave.” These stunning works reflect the diverse ideas, beliefs, and artistic styles of China and the Silk Road in the 8th, 9th and 10th centuries. The art displays the co-mingling of major cultures - Greek and Roman via Ghandaran India, Middle Eastern and Persian, Indian and Chinese. A multimedia experience will comprise the third part of the exhibition. New 3D stereoscopic immersive technology, never before used in a museum exhibition, will enable visitors to examine in detail the magnificent sculpture and painting of Cave 45. This 8th -century cave exemplifies the artistic brilliance of Chinese art of the High Tang period (705-781). 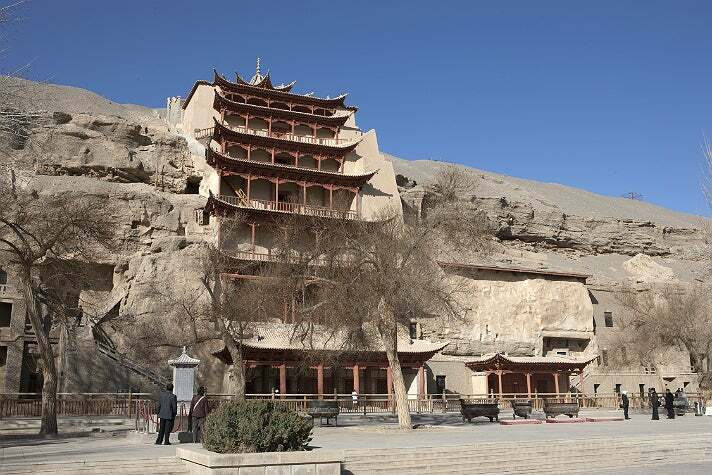 The exhibition will also focus on the modern history of the Mogao cave temples at Dunhuang, highlighting the Getty Conservation Institute’s work in partnership with the Dunhuang Academy to address the preservation challenges of this singular site. A highlight of the exhibition is the Diamond Sutra (a sacred Mahayana Buddhist text) that dates to the year 868 CE. 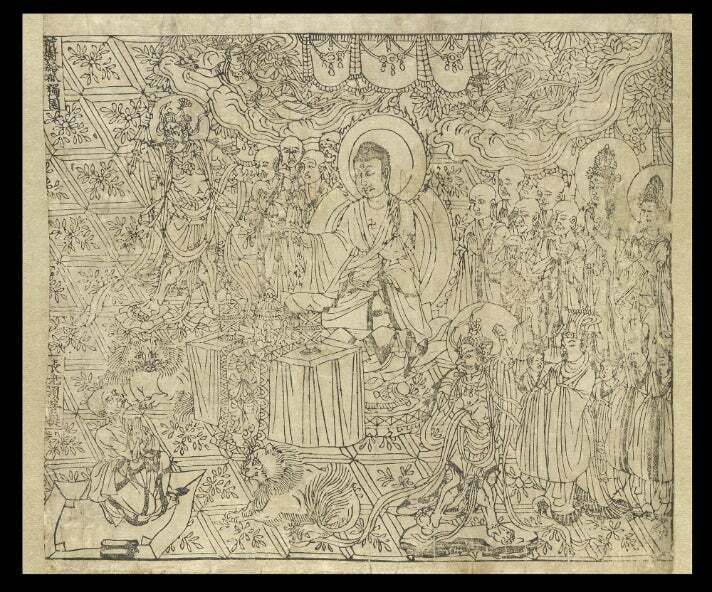 On loan to the Getty from the British Library, the Diamond Sutra is the world’s oldest dated complete printed book. The exhibition features objects from the Library Cave, where more than 40,000 objects, sealed up for a millennium, were discovered in 1900. Shortly thereafter, explorers from Britain, France, Russia, Japan, and the United States came to Dunhuang, where they obtained thousands of these objects to take to their home countries. Focusing on the diversity of languages and religions on the Silk Road, the first exhibition gallery features a Buddhist sutra in Tibetan with commentary in Chinese, a Jewish prayer in Hebrew, and a Christian manuscript in Chinese, all written no later than the 10th century. 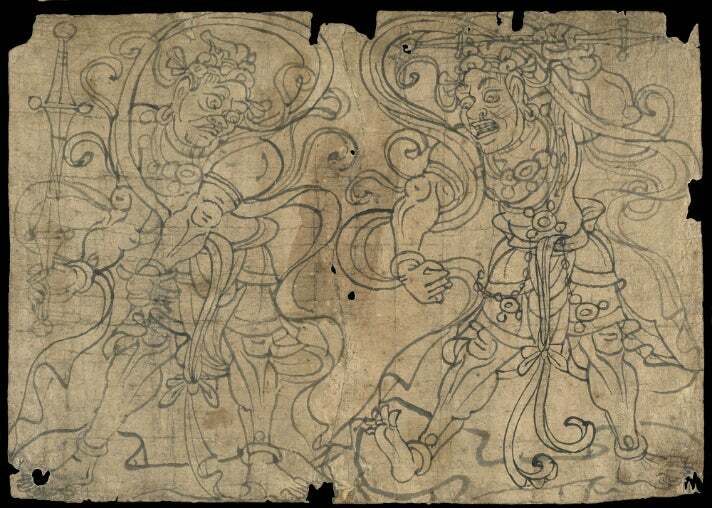 The exhibition demonstrates how Buddhist texts prescribed rules governing artistic practice, displaying a stunning group of freehand sketches, pounces, and woodblock prints from the Library Cave. Superb early Chinese paintings on silk portray scenes from the life of the Buddha, Buddha preaching, and a bodhisattva leading an elegant Tang lady toward a paradisiacal afterlife. All illuminate how commissions of paintings created personal connections with the divine for their patrons, while ritual diagrams instruct on precisely how to create a sacred space. “These exquisite Buddhist works, originally from Dunhuang, were created not as works of art, but rather as forms of devotion to accumulate merit and ensure a better afterlife,” says Mimi Gardner Gates, director emerita of the Seattle Art Museum and chairman of the Dunhuang Foundation. To illustrate the life of a wall painting and trace its 1,100-year history—from creation to deterioration and conservation—the exhibition includes a recreated portion of a wall from Cave 85. Exhibition videos describe the history and significance of the Mogao site, as well as modern conservation efforts. Reproductions of photographs by Western explorers and others document early 20th-century investigations of the Mogao caves, including the discovery of the Library Cave. The site’s revitalization in the 20th century, under the stewardship of the Dunhuang Academy, concludes the exhibition. The Getty Center arrival plaza will house three full-size replica caves, providing visitors with a deeper understanding of the Mogao site and the scale of the cave temples there. The replica caves, created by artists from the Dunhuang Academy’s Fine Arts Institute, were constructed through a painstaking, multi-year process that includes photographing and printing images of the caves’ walls at their original scale, tracing the images with pencil, and then contour-line drawing on top of the tracing. Clay from the local riverbed is used to make the base for the painting of the primary pigments. The paintings are then mounted on the inner surface of the replica cave’s wooden framework, which has been crafted to the exact dimensions of the original cave. The replicated cave temples span the 5th to the 8th century. 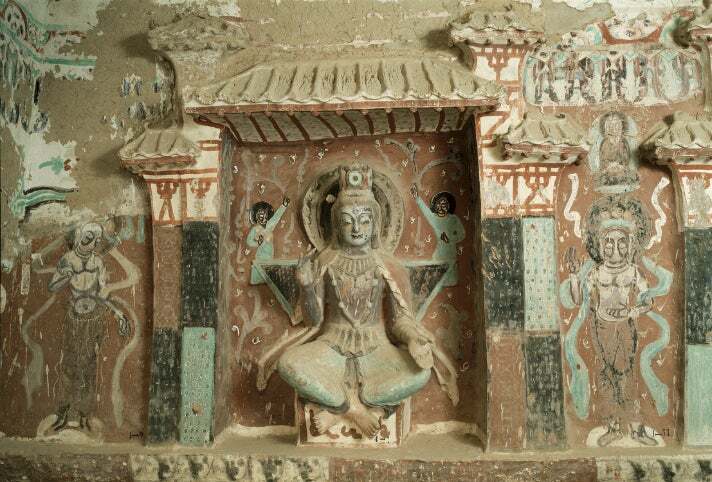 Cave 275 features a large central image of Maitreya, Buddha of the future, as well as five painted stories of the Buddha’s past lives. The earliest dated cave, Cave 285 was created in 538 CE and 539 CE. The brilliantly colored, dynamic wall paintings incorporate Hindu and indigenous Chinese deities into a Buddhist context. Dating from the 8th century or Tang dynasty, Cave 320 has a magnificent ceiling with a central peony motif, surrounded by decorative tent hangings and numerous small Buddhas. The exhibition is accompanied by two multimedia galleries, which will visually immerse visitors in the Mogao site. The first section will include a large panoramic projection with an overview of the Mogao cave temples in their stark desert setting. 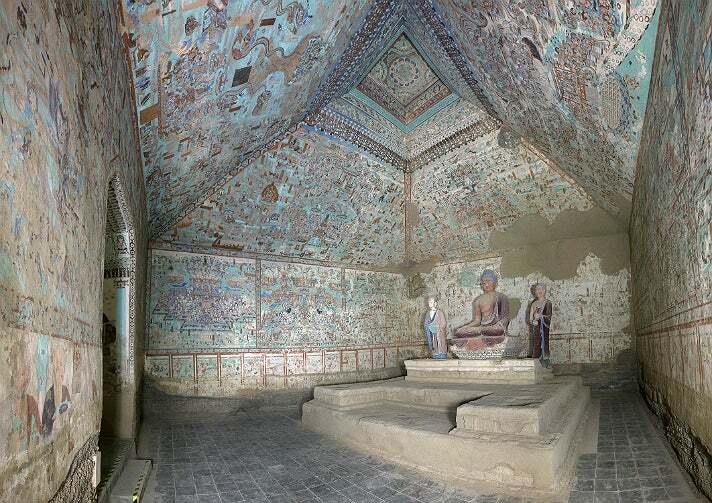 In the second section, visitors will use 3D glasses to experience stereoscopic images of Cave 45, a finely decorated High Tang cave with a seven-figure sculpture group that is one of the treasures of Mogao. This marks the first time that this particular 3D stereoscopic technology has been used in a museum exhibition. 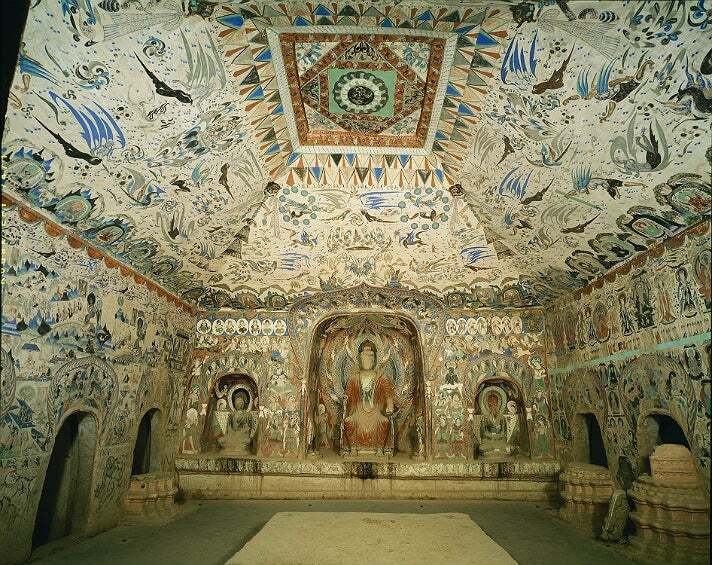 Cave Temples of Dunhuang: Buddhist Art on China’s Silk Road is on view May 7 – Sept. 4, 2016. All parts of the exhibition are free, but visitors may encounter long lines. To reduce wait times to the replica caves, a limited number of free timed tickets will be available at the Getty Center on the day of your visit. Tickets cannot be obtained in advance. To download a site guide to the exhibition, visit the Getty Center website.